Winters here are spent planning, writing and scheming for the riding season ahead. Unlike so many parts of the country, t He Northwest truly does have a riding season, just like it has all the other seasons. From late October to the first of April my harem of five motorcycles is mostly benched. Don't get me wrong - I've ridden plenty in the fall and winter, but these days I'm enjoying working indoors when it's cold and navigating Seattle's vast array of potholes in a Honda Element instead. Who needs an axel nut when you've got recue tape and zip ties? So when spring rolls around, the itch is severe and the need to ride is overwhelming. For 2010 we had planned to operate two tours - one road and one dual sport. Pre-riding chores were in order. Add to that a host of rally appearances, advance riding for upcoming 2011 and 2012 tours and book projects and the recipe was set for a 20,000 mile adventure in 2010. If you stow your bikes in the winter, you basically begin spring by relearning how to put on and take off a helmet. Then you have to relearn how to ride! The first ride came in April when I saddled up my 1972 Honda SL350 and rode east from Seattle to the peaceful	casino	town of Snoqualmie to partake in Tom Samuelsen's Bonehead Enduro. I had breakfast, checked the weather and , instead, rode back to Seattle. The idea of a 40 mile mud run wasn't something that enthralled me as I was just getting my wings back on. As always, the 350 performed exceptionally well, firing up on every first kick (thanks George Dean) and making SR 202 seem too fun. I later took a dual sport trip with the Puget Sound Dual Sport Enthusiasts. Arriving on the south slopes of Mt. Baker, the ranger asked "do you always ride like that" pointing to my rear axel - which was hanging halfway off the bike. Somehow I'd lost the nut and didn't have a spare. We put on our thinking caps, asked around for spares, which no one had , and came up with another solution. The axel was wrapped with Rescue Tape and bound with several zip ties. My new friend Tad followed me 30 miles back to Sedro Wooley where we located a nut, washer and wrench, making it like-new again in time to join the others for lunch. 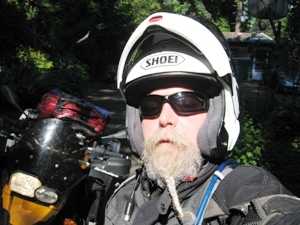 In May , I lured my friend Bob Depot and his Victory tourer	to a pre-ride for the Road Trip: Oregon tour , riding span LANG="EN"> my 04 Yamaha FZ6 . It was going to be five days of riding Oregon's western back roads, camping each night and staying out of restaurants for the most part. With the exception of several inches of rain that fell between Detroit and Sisters on the first afternoon, the ride was perfect weather-wise. We'd stock up on groceries each afternoon and make every meal along the way - except for that one time we snuck coffee and cheesecake in Myrtle Point. Bob D. rides through one of several covered bridges on the Road Trip: Oregon pre-ride. During the winter, Walter Meyers at Seattle Cycle Service had outfitted the FZ6 with a brand new suspension setup, making a giant difference in how the bike handled. Utilizing R6 forks in the front and a well-tuned Penske spring set in the rear, the bike responded fabulously to all types of surfaces. The ride had so many back roads, it seemed at times you weren't even in America. As we rode through Dallas (yes - there is one in Oregon), I commented to Bob it seemed more like going through Italy. He returned from the restroom, straddled his bike and rode off as his GPS instructed him verbally, "Girare a sinistra sulla strada statale 223 . " We both had a laugh on that, until he made a wrong turn and the woman officiator began yelling at him - "A girare intorno, siete andati nel modo sbagliato!" but neither of us speak Italian so it meant nothing. It only took us four 300 mile days to figure out how to use a Zumo. My friends Eric and Steve Folkestad put on the Hell's Canyon rally each June in Baker city. They had requested my presence on Saturday night to receive some sort of lifetime achievement award. At the tender age of just fifty, I begged Steve - 'Won't you let me die first?' He wouldn't have it, so I had Moto International mount a new set of Avon Viper Strykes on my 02 Honda Silverwing and off I rode - on the back roads. Having just released my third touring book, Motorcycling through Central and Eastern Oregon, I enjoyed several days of those roads and couldn't get enough. I can never get enough of that area. The tires were now broken	in on the Silverwing and it was my mount of choice later in June to run the official Road Trip: Oregon tour. This time my friend Bob Tomlinson (another Bob enters the picture) and I followed the route Bob D. and I had etched the month before. As I recall, we never saw a drop of rain the entire five days. Starting the group of 30 plus at Panorama Point in Hood River, and ending five days and several thousand corners later at the column in Astoria, it was a trip I could enjoy year after year. Part of the Road Trip: Oregon group amassed at Panorama Point. Early in July, Bruce Scott and I headed to the Columbia River Gorge to handle pre-riding chores for the upcoming Rally in the Gorge. You'd think after eight years we'd know every road there, but we still end up on new ones. For this trip I'd selected my 88 Honda NX250. Its light	weight and dual sport setup make it a good choice both on and off the pavement. My latest 'Ride with a plan' technique was learning how to use copious amounts of compression to control the bike, greatly reducing the amount of braking and jerking around of the bike through corners. Getting there by way of FS 25 on the east side of Mt. St. Helens was done primarily in second and third gears between 7,500 and 9,000 rpm. The 250 thumper redlines at 9,500. I touched the brakes about three times in total between Randall and Carson. The result - one of the most fun rides I'd ever done on a motorcycle. While in the Gorge , we pre-rode the fun run, visited with the Stevenson Chamber of Commerce, our caterers and Sherriff Brown. In Skamania County , there are a number of gravel roads you won't find on maps. They are not in an atlas, not in a MapSource GPS program and certainly not on a folding map. But they are there, as we found out , and Sherriff Brown was helpful in providing the details. 'Turn right at the five way and head west' he said, and so we did. The road was wide, it wasn't rutted but the next several miles of large crushed rock made for a challenging afternoon. Between the high RPM antics around St. Helens and horsing the bike through Skamania's mystery roads, the chain on the NX250 was pretty much toast. I made it home and threw the chain away. Don't waste your money on non-O-ring chains. We now took a brief pause, loaded up the Element and went to Redmond Oregon to attend a small gathering of German motorcycle enthusiasts. And then it was back to work. For the rally in the Gorge I went back to the FZ6. Greg Maust and I headed to the Gorge the Sunday before and , again, I played the high rpm game around St. Helens, only this time on a sport standard rather than a dual sport. The results? Another fantastic performance ride for both of us. The rally was a great time and gets more fun each year, even for the staff as we streamline operations and sneak in a little riding time ourselves. I enjoyed the fun run taking a 200 mile test ride on Kymco's new fuel-injected Downtown model, which perhaps would be better titled the Cornering Monster. After passing a dozen or so sport bikes between Multnomah Falls and Vista Point, it was clear Kymco had built a fantastic low CG ride. On the way home from the rally, the National Park Service confirmed the FZ6 was capable of doing 55mph in a 35 zone. Uh oh...better call Jeanie Muckelstone. Greg's rear tire after that fun ride along Mt. St. Helens, the poker run around Mt. Hood and then a trip up to BZ's Corner. All the while, our Sasquatch dual sport pre-rider, Bob Owen (enter a third Bob) was busy working his way through the lower Cascades range and up the Oregon coastal range hammering out the 2010 Sasquatch route. Washington State seems to be a piece of cake to pre-ride compared to what we came up against in Oregon. In Oregon you get to deal with many forest fires and several layers of government and private timber organizations. In the end, Bob had crafted a great route. In mid-August sixty seven riders thoroughly enjoyed ourselves for the full five days of this second annual event. For this trip , I pulled my 88 Honda NX650 (big brother to the 250) together. Different bike, same problem - thanks Pro Caliber Motorsports of Bend for providing a new O-ring chain on that fateful Tuesday morning. August ended, but riding season was far from over. In early September , Bob Tomlinson loaded up his 08 BMW F800ST, I loaded up the FZ6 and we headed north to scout Canada five days in search of a route for a possible road trip tour in 2011. The conclusion was that while Canada has some great roads, they are spread far enough apart from each other to make for a very un-interesting tour. Canada is in short supply of the endless threads of twisties such as those found in Oregon. Bob O. working on the Sasquatch pre-ride. The braided beard is so no one will mistake him for a Sasquatch. But was the idea of running a road trip tour in 2011 dead? Not yet. There was one more place to visit before the fall moisture set in - Idaho. Steve Schiller (CMA) and Tim Bernard (Happy Trails/CMA) had invited me to their rally in Kamiah, Idaho , in mid-September. I had my reservations. Weather was one of them. Tim simply emailed back - 'high 60's in the day, low 50's at night.' I could live with that if it really worked out that way. And it did. The tires on the Silverwing only had a few thousand miles on them at this point. Knowing there would be plenty of twisties on this trip , I opted for it again. Steve had put together a number of ride maps taking riders away from the mainline of US 12 and sending them out into the back roads in the area. The long weekend was a blast, discovering hundreds of miles of roads I'd never been on before. And as a result I was able to cobble together sections I'd ridden in Eastern Oregon, connect them together with the new Idaho discoveries and create what should be an excellent five - day Road Trip: Oregon/Idaho tour in 2011. I wasn't home yet though. Upon carful inspection of the rear tire in Kamiah, there was a problem looming. Lack of tread. Tire depth is measured in x/32s and in this case there was 0/32s of tread depth after 3,500 miles. The price one pays for sticky cornering rubber versus hard touring compounds. I was in a bit of a panic and called David Hough to consult. We discussed ways of nursing a balding tire and getting the Silverwing back home on what little rubber it had. The sides of the tires still had tread. Knowing that I'd have to ride from Cle Elum to Seattle on the flat center surface since I-90 is the only option, I opted to create a return route with as many twisties as possible to Cle Elum, so more time and mileage could be spent on the outer edges of the tires. And it worked. On Sunday morning I rode out of Kamiah beginning with several miles on a gravel road, and wound my way back over a route that took some ten hours to complete. At each stop I checked to see if the threads had appeared. David and I had discussed earlier what comes after that, but it never occurred and I limped into Seattle without a flat. Riding season ended. Oil changes, new tires and general maintenance are on the list of things to do this winter. 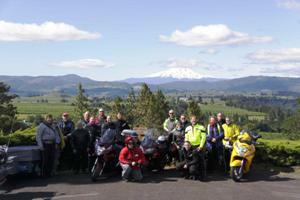 It's friends like Eric & Steve F., David, Bruce, Greg, Tim and Steve S. that make riding in the Northwest so much fun. And of course , it goes without saying - thanks Bob, Bob and Bob.